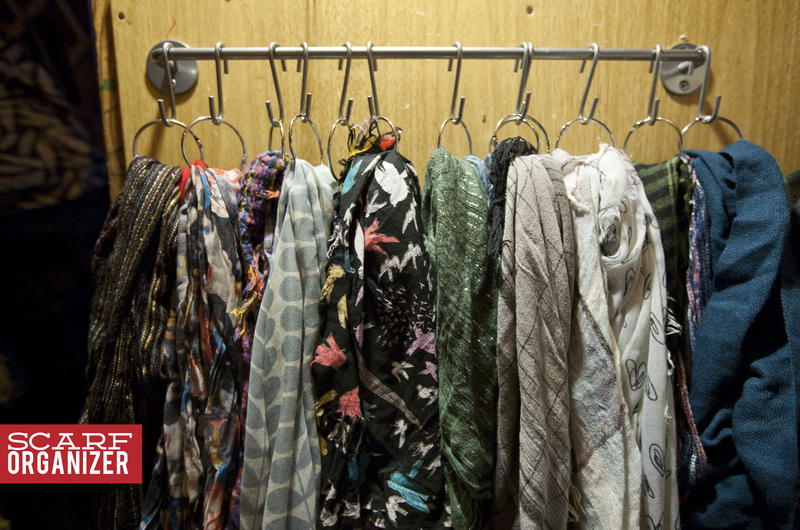 I have alot of scarves. And I cram them all in a drawer and forget about most of them. I searched on pinterest and found that by buying a $1.99 BYGEL rail from Ikea, 99 cent S-hooks from Ikea and $7 shower curtain rings from target, I was able to make a simple organizer. I’m always jealous when everyone posts all these amazing recipes with nutella to pinterest. I tried to buy some vegan nutella in Paris, two years ago, and they confiscated it because I don’t check my bag and it was larger than 4 oz. But when I made my almond-tella a few weeks ago, I was going to save it to make one of those recipes. 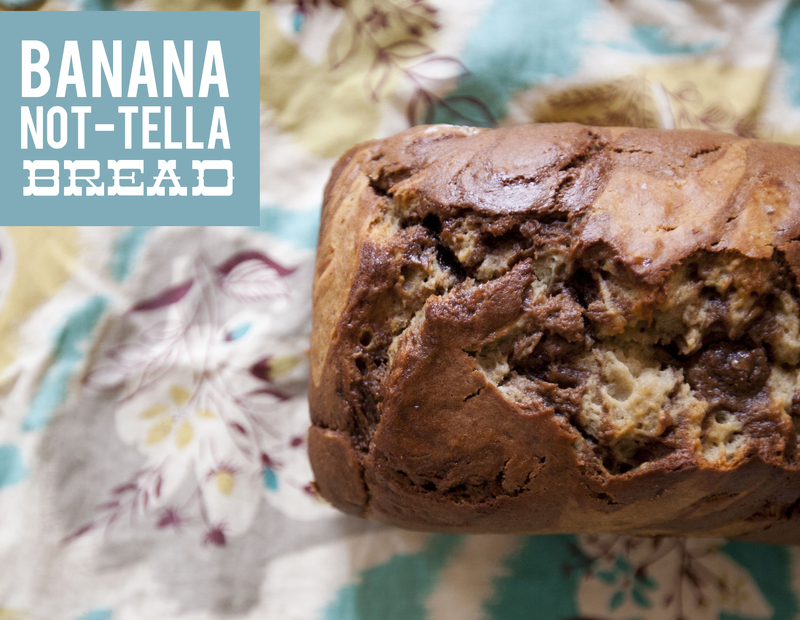 So I took this recipe for banana nutella bread, and made it my own! Preheat oven to 350 degrees. Spray 8×4-inch loaf pan with nonstick spray. In a separate large bowl, beat sugar and earth balance with an electric mixer at medium speed until blended. Add egg replacer, beat well. Add banana, almond milk and vanilla. Beat until blended. Add flour mixture, beat at low speed just until flour is incorporated (don’t over mix). Spoon almond-tella into a small dish and soften in the microwave for about 15 seconds. Add 1 cup of the banana bread batter to the almond-tella and stir until blended well. Spoon almond-tella batter alternately with plain banana bread batter into the prepared pan. Swirl batters together with a knife. Bake 50 to 60 minutes. Cool for at least 15 minutes in the pan, and then turn out onto a wire rack to cool completely. Ok, maybe this isn’t the most glamorous post…but I’ve been seeing some ants near the kitchen sink. Not sure what exactly is causing this, but I would like them gone. I went to Menards this morning (for probably the seventh time in a week), and on my list were ant traps, but when I found them they were $6 and I realized the active ingredient was borax. Since I have a whole box of borax at home, I figured I would try to make something natural instead of buying those traps at the store. Place the ingredients in a small glass jar, shake to mix. Soak a cotton ball in the mixture, slightly squeeze out the excess liquid, and put the cotton ball on a small lid. Place the ant trap where you see the most ants. 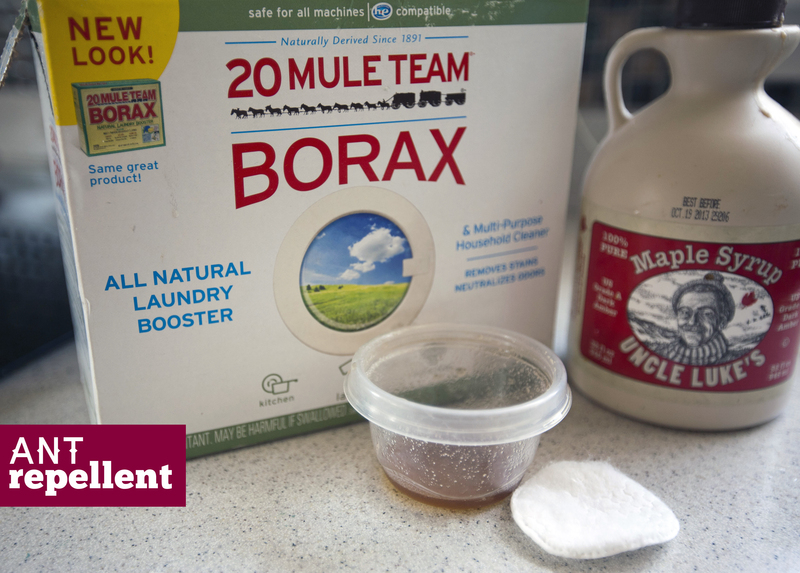 After the ants have disappeared, discard the cotton ball and keep the lid for reuse. After three hours at ikea, one of the many much-needed things we needed for the new house were curtains. I’m not totally sure what to do with that front room yet. I want to get some fun chairs, but I think it will take some time to find. I was reluctant to pick curtains first, because they will dominate what the rest of the room has to look like now. But you can see right into the house, so we needed to get something up there for the time being. I settled on these curtains. At only $25, if they end up being too loud for the furniture we pick in there, I’ll use my sewing skill sand we’ll find somewhere else for them to go! But for now (maybe even permanently, here they are! I’m blogging about it because I hemmed them! We had curtains once in our bedroom at the condo and they were about 2 feet too long (and really ugly), so I ended up getting rid of them because I didn’t have the skills to hem them. Not this time! 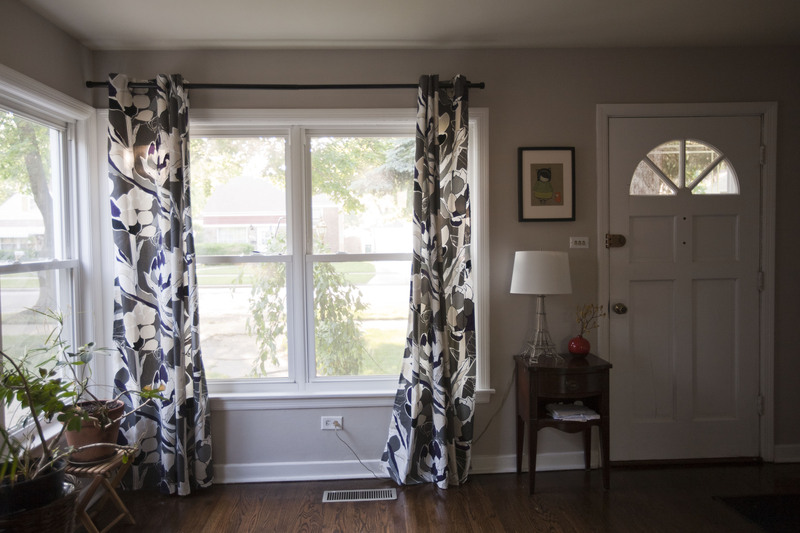 I’m going to full embrace having curtains….and hoping to make some for some other windows too! 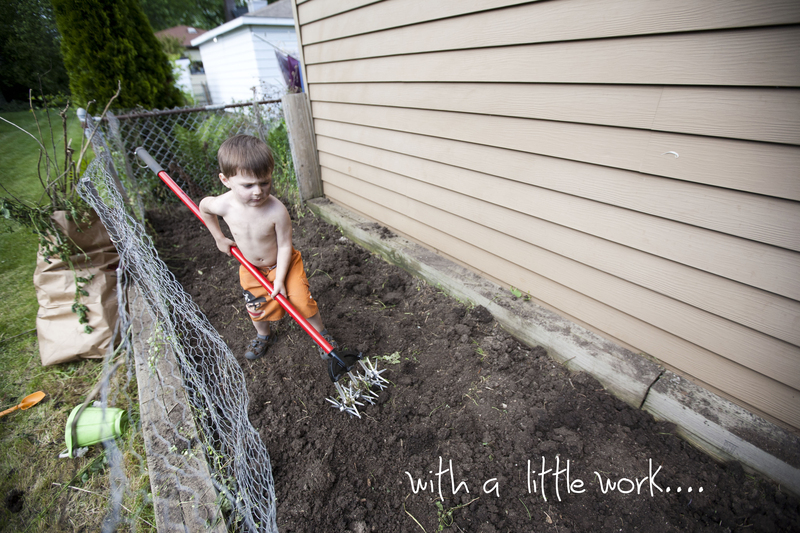 Today we worked really hard to get the garden in order! 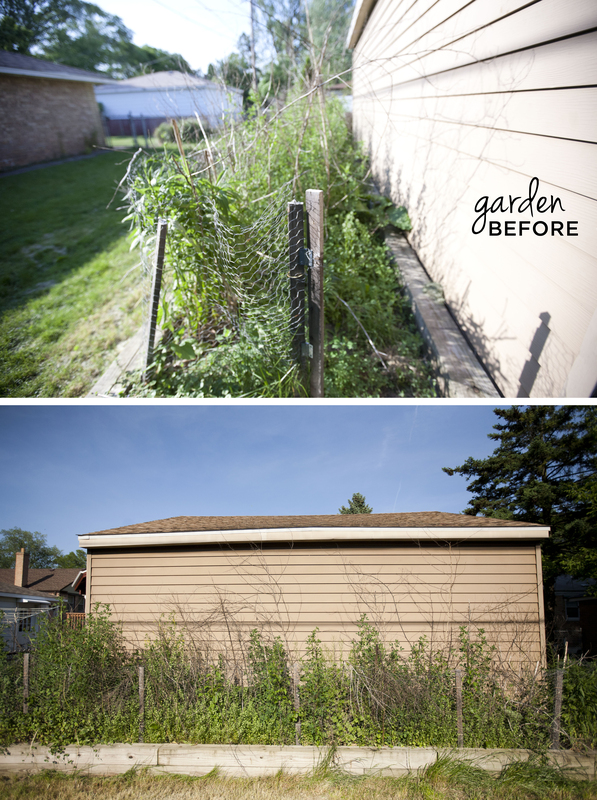 The house has a nice raised garden bed behind the garage, but it was overgrown with weeds. We did alot of work to get them out, and got everything planted today. This year I’ll have six tomato plants, habenero pepper, red bell pepper, hot chili pepper, artichoke, watermelon, strawberries, basil, cilantro, cucumber, zuchinni and okra. Im hoping to get some parsley and a brussel sprout plant. It was a ton of work to get accomplished in a day, but I’m so happy were done. 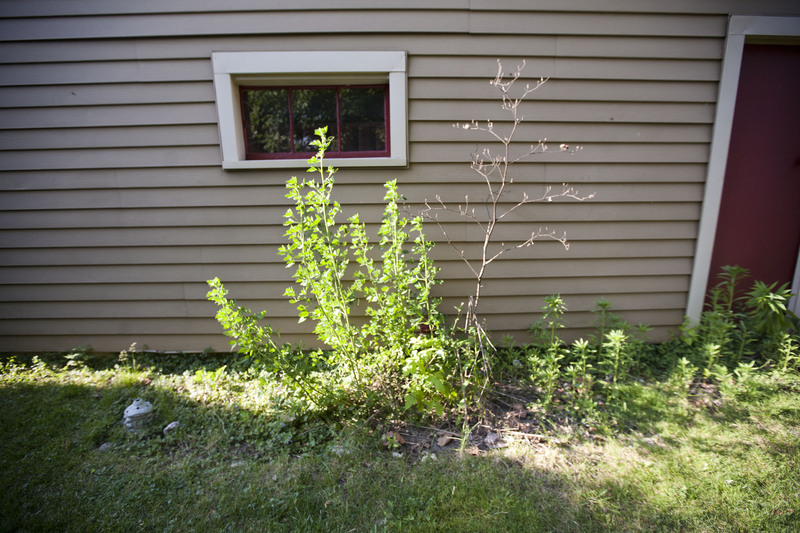 We have a yard! Which means time for gardening and planting!! 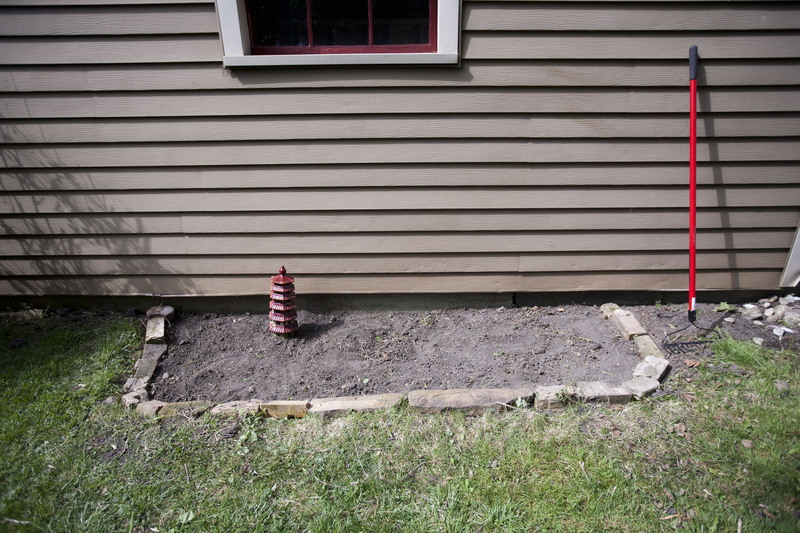 Then getting the are ready to plant…Found those old bricks in the yard and built a little path around the soil. 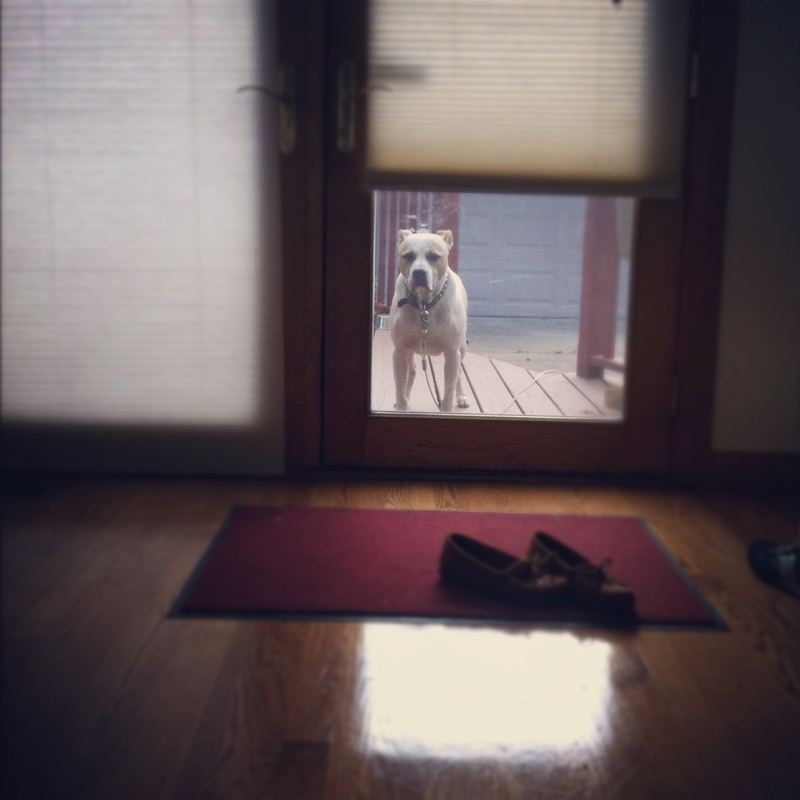 That little statue was left from the previous owner. 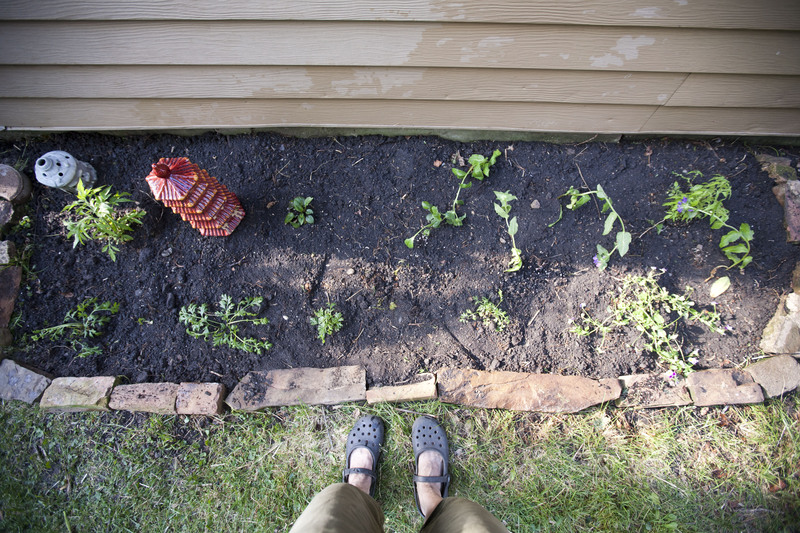 Flowers planted! I planted all perrenials with the hope they will come back and give me some love every year! 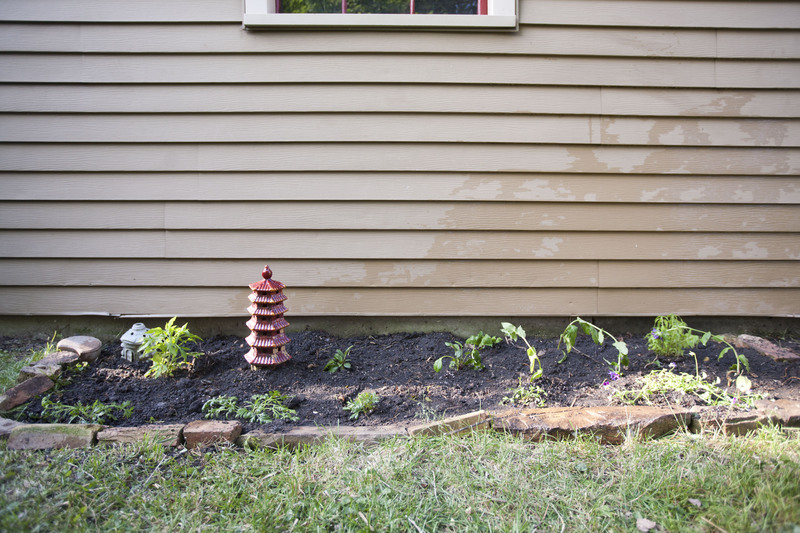 I planted some cone flowers, painted daisies, brown eyed susans, two plants that the previous owner left, and four of my neighbor’s purple flowers. We live next door to a 90 year old, lovely lady who has beautiful flowers in her yard. She insisted I come by and look at everything she has planted. She had these beautiful tall purple flowers that she took from HER neighbor forty years ago when she lived in skokie. She wanted me to take a few and plant them as well. Hopefully I can make them thrive like she has! I forgot to take a “before” picture! doh! A few weeks ago, my co-workers and I set out to the North Shore Rummage sale. I was hoping to get more practical stuff for the house, but instead ended up with a bunch of random things, one of which was this hippo planter for $1. It was shiny and white, and had a wierd mark/stain on it. So the other night when we were actually getting practical things for our house at Menards, I realized since I don’t live in the city anymore, I can actually buy spraypaint! 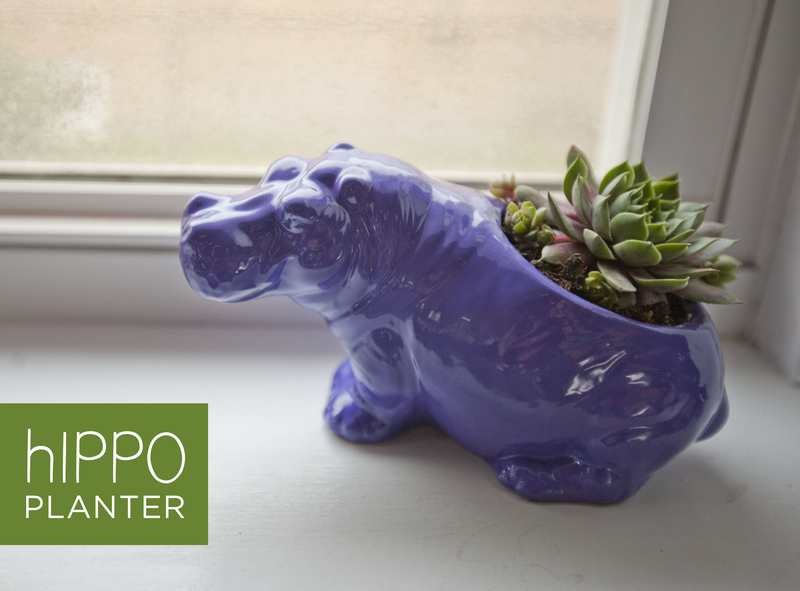 And for $3.44 I was able to transform this hippo planter! Needed time to fuel with a smoothie. 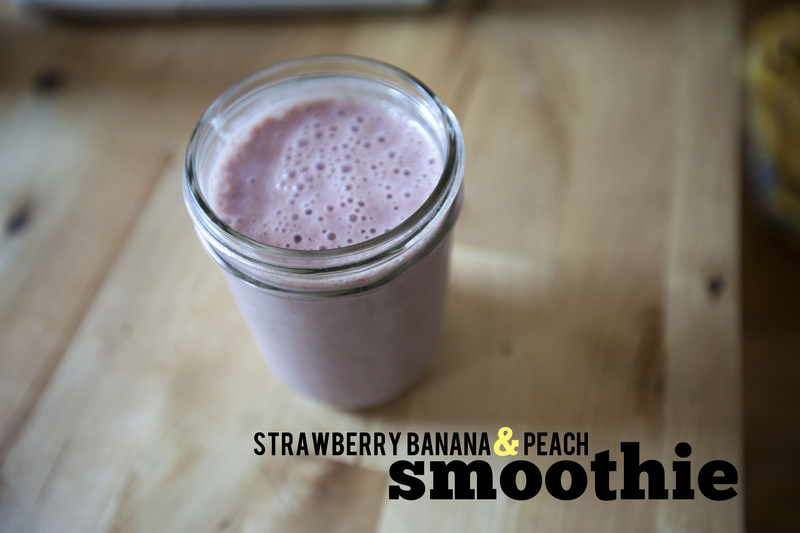 Almond milk, frozen strawberries, frozen peaches and banana. Added some hemp seeds, flax and protein powder. Today marked the first day of the farmers market in Daley Plaza! I got some vegetable plants to start my garden this weekend, and some asparagus and snap peas and peonies. I love farmers market season!